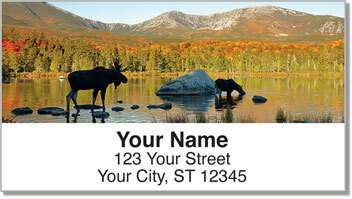 Put the wonder of the wilderness on your outgoing mail with unique return address labels depicting the moose. The nature photography on these convenient, self-adhesive labels features pristine and peaceful landscapes displaying four amazing images. They include a massive bull moose satisfying his mighty thirst and two young calves wading in the water. 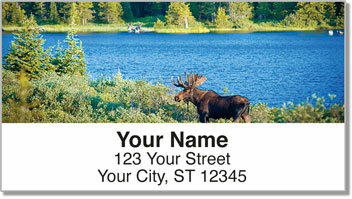 Moose Address Labels from CheckAdvantage are a great way to add a touch of the outdoors to every envelope you send. This product can also be used to mark all sorts of personal property as your own. 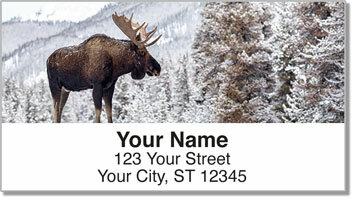 Order Moose Address Labels right now! 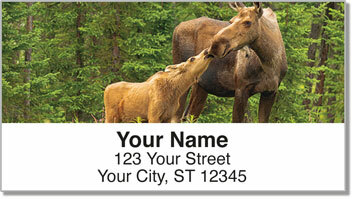 You can also find matching Moose Personal Checks on our website.